“On behalf of President Obama and the American people, I congratulate the people of Cameroon as you celebrate your national day on May 20. The United States and Cameroon have enjoyed a productive relationship since we first established diplomatic relations in 1960. Our bond has strengthened over the years, in part through our shared commitment to support peace and stability in central Africa. Our governments work together on many fronts. We are working to curtail illicit trafficking. We are working to protect the environment. We are working to improve maritime security. We are working to address the threat posed by terrorism. And we are working to support the stabilization of the Central African Republic through the provision of U.S. equipment and training to Cameroonian troops deployed there as peacekeepers. Our trade and economic relationship continues to grow as U.S. investment in Cameroon steadily rises. 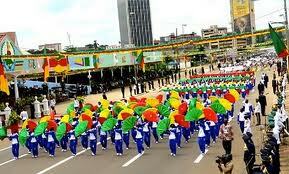 As Cameroon prepares to celebrate 42 years of unity, we welcome the opportunity to strengthen our partnership. Together, we can help bring greater security and greater prosperity to the entire continent. This entry was posted on May 19, 2014 by grahamtbaden in Nom d’Être and tagged Cameroon, cameroon independence, independence, national day.